The Barn in Corney, near Bootle sleeps 12 people. Definitely off the beaten track, this wonderful holiday home stands in the most beautiful of settings. Lying to the western side of Corney Fell, which is dominated by Black Combe, you will enjoy the most extensive views. The former Foldgate Farmhouse, nestles around a courtyard with outhouse and stables, and has been extensively refurbished. The farmhouse has lovely features - wooden and flagged floors, beams and open fires and has been warmly decorated and furnished with style and great attention to comfort. This welcoming home from home will be a haven to relax and unwind, enjoy the views from the outdoor hot tub or decked areas; or just curl up on the sofa and read a book by the fire. Alternatively, there are plenty of attractions for you to visit in the nearby locality. The small town of Bootle is just 1 miles with shops and pubs, the lakes Wastwater, Ennerdale and Coniston are all within a 20 minute drive. The coast is 2 miles, Muncaster and Ravenglass 5 miles. Golf and riding nearby. Shop and restaurant 11/2 miles, pub 1 mile. Ground floor: Living room. Second living room with beams and wooden floor. 2 steps down to dining room/kitchen with beams and flagged floor. Utility room. Shower room with toilet. First floor: 4 bedrooms: 2 double (5ft), one with en-suite shower room and toilet, 1 double with 2 additional singles, 1 twin (zip and link). Bathroom with jacuzzi bath and toilet. Steep stairs to second floor: 1 double bedroom with beams, sloping ceiling and en-suite shower room with toilet. Open fire in living room and woodburner in second living room (initial fuel included). Oil central heating, electric, bed linen and towels included. Cot. High-chair. Satellite TV. Video. Stereo/CD. Electric cooker. Aga. Microwave. Washing machine. Dish washer. Fridge/Freezer. Wi-Fi. Payphone. Garden and furniture. Two decked areas. Barbeque. Play area. Balcony with covered hot tub (for 6 people, can be accessed from first floor double bedroom). Ample parking. Natural water supply from borehole. Two dogs welcome (sheep country). No smoking. Holidays at The Barn run from Friday to Friday. The Barn is in Cumbria; should you be on the lookout for a special offer, you can find all the special offers in Cumbria. It's always worth checking to see what is on offer at the moment. 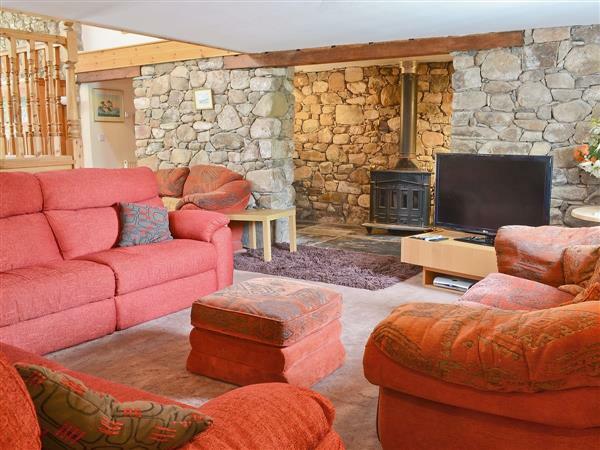 Do you want to holiday near The Barn (23451), you can see other cottages within 25 miles of The Barn; have a look to find your perfect holiday location.